WHEN ALLEN GINSBERG arrived in San Francisco in August 1954, the famed San Francisco poetry scene was thriving with such luminaries as Kenneth Rexroth, Robert Duncan, and William Everson. Ginsberg's recitation of Howl in November 1955, at the Six Gallery, galvanized that community and brought the Beat aesthetic to the West Coast: this signaled an era that would become known as the San Francisco Renaissance. A number of the younger poets followed Ginsberg's example and began producing poetry that owed more to the Beat experience of New York than to the older, established poets of San Francisco. From Yugen No. 3. New York: LeRoi Jones and Hetty Cohen, 1958. ALLEN GINSBERG MET twenty-year-old Peter Orlovsky within a year of his arrival in San Francisco, and the two quickly became inseparable. Orlovsky traveled with Ginsberg to Tangiers to help Burroughs work on Naked Lunch and accompanied him on subsequent journeys to India, Nepal, and Japan. Peter Orlovsky, like his New York counterparts, Cassady, Huncke, and Solomon, contributed more to the Beat movement through his presence than from his actual literary output. A Coney Island of The Mind. New York: New Directions Books, 1958. City Lights Journal, Issues 1-3. San Francisco: City Lights Books. LAWRENCE FERLINGHETTI ATTENDED Columbia University at the same time as Allen Ginsberg and Jack Keroauc, but apparently never made their acquaintance. He shared with them a love of avant-garde literature, travel to exotic places, and libertarian pacifist politics; but he never identified himself as a Beat. In 1953 Ferlinghetti, with Peter D. Martin, founded a bookstore in San Francisco that sold only paperbacks called City Lights (after Charlie Chaplin's movie of the same name). 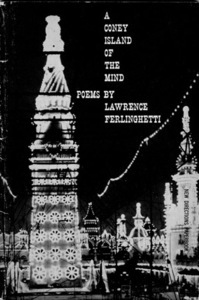 After buying out Martin in 1955, Ferlinghetti began publishing a series of avant-garde poetry and fiction under the imprint of City Lights Books. 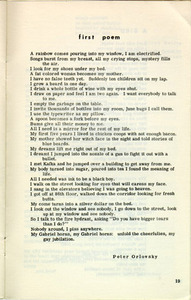 Howl by Allen Ginsberg was number four in the series and became City Lights Books' first major success. A highly successful poet himself, Ferlinghetti published most of the influential Beat writers, including Kerouac, Burroughs, Corso, Snyder, Di Prima, and Jones. Ashland, Mass. : Origin Press, 1959. GARY SNYDER HAD a profound influence on the Beat aesthetic with his devotion to Zen Buddhism and his adherence to a simple Spartan lifestyle. He attended Reed College with Philip Whalen and fell in with the Beat crowd through his association with Kenneth Rexroth. Snyder so impressed Ginsberg and Kerouac with his Thoreau-like existence that both became devotees of Buddhism. He and Kerouac climbed Yosemite's 12,000-foot Matterhorn mountain, and Kerouac always remembered the experience as one of the most memorable of his life, ­so much so that he wrote Dharma Bums about Gary Snyder. 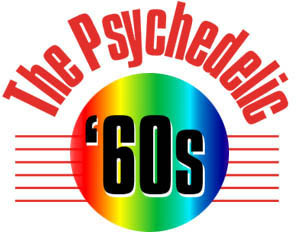 Snyder left the San Francisco Beat scene in 1956 to pursue his study of Zen Buddhism in Japan. He returned twelve years later to find himself already established as a seminal figure in the new hippie scene. 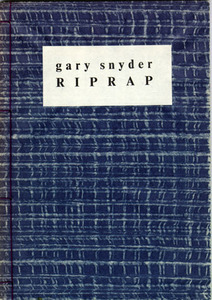 Rip Rap is Snyder's first published book of poetry. Alan Watts. Beat Zen, Square Zen, and Zen. San Francisco: City Lights Books, 1959. ALTHOUGH ALAN WATT'S was born in Great Britain and did not consider himself a Beat, he lived around San Francisco in the late fifties and was one of the early writers to bring Eastern thought to the West. His books on the virtues of Zen Buddhism were widely read and greatly influenced the direction of the Beat movement. 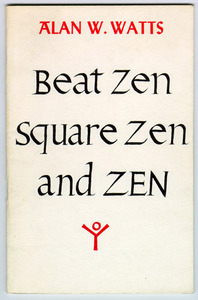 Beat Zen, Square Zen, and Zen, is Alan Watts' essay on Zen Buddhism.